Old School Boat School. On The Web, Whats Next? The Amish? Well, yes, actually the Amish are on the web? Dang! I suppose it was inevitable since they started making those cheap fire places we see on TV 24/7 Well, here ya go. 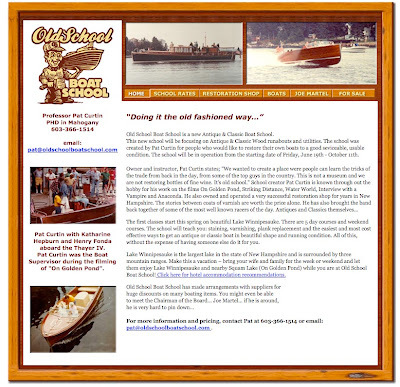 Old School Boat School has gone all web like on us. And what do we have here. Joe Martel? This looks like a fun time even if all you learn is how to keep air bubbles out of your varnish. But from the look of things it’s way more than that. Some of the boats these guys have worked on are amazing. And the stories from Pat Curtin are worth the price of admission alone. You can click on the image or here. OldSchoolBoatSchool.com Have fun. The lodging is amazing!